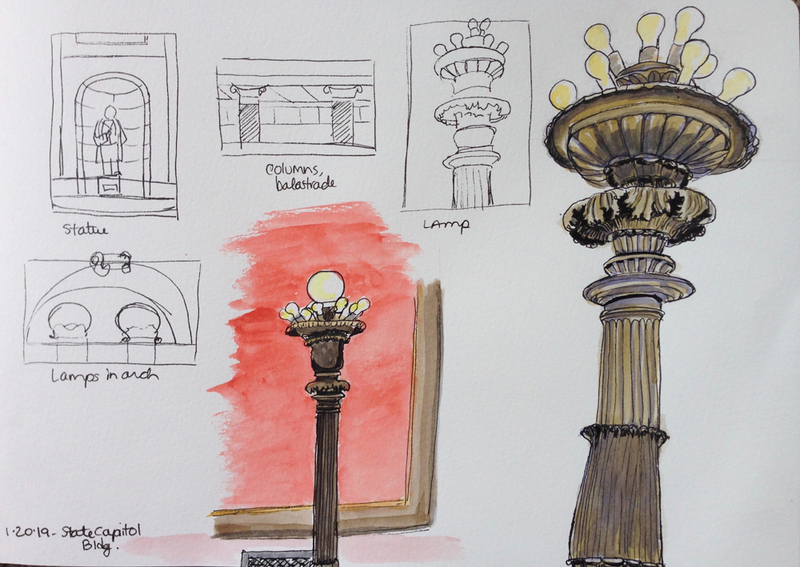 Yesterday my urban sketching group sketched the Minnesota capitol building. The weather is frigid and we worked indoors. I sat on the second floor of the rotunda on a very cold marble bench. I was overwhelmed visually with all of the colors, columns, arches, statues, and perspectives of the space. Drawing little thumbnails is something I am working on in a class I am taking, and it worked well to do it here. I could explore possible options and compositions before jumping into a large sketch. I chose to focus on fixtures for this sketch. And I liked the lamp with its ornate and detailed metal work, its darks and lights, and its unique shapes. So I sketched it carefully. It was tedious, but fun. Later, I sketched a second lamp in a hallway against a large orange wall. I liked its contrast with the colors behind it. Sometime I hope to sketch more of the architecture. But when overwhelmed, I have learned to pick a smaller focus, one that is manageable, and it too, tells a story!